This model is newly designed product of my factory which not only contains the features of common models but also has new advantages. The machine body can be easily lift up so it is very convenient for daily maintenance. This machine can pack grain ( Food, local specialty, medicine, electronics, hardware), powder ( coffee, wheat), paste( ketchup, honey, seafood). The main principle is the air in bag is inhaled and the bag is sealed at the same time. This can constrain the propagate of organism, food oxidize and rotten which can prolong the valid time. Some loose products are easy to transport and store after packed. 1) The packing film adopts plastic compound film or plastic aluminum foil compound film. 2) The packaged production can avoid to oxygenizing mildewing, rusting, wetting and pro-long the reserve time. 3) The cover is transparent organic glass. 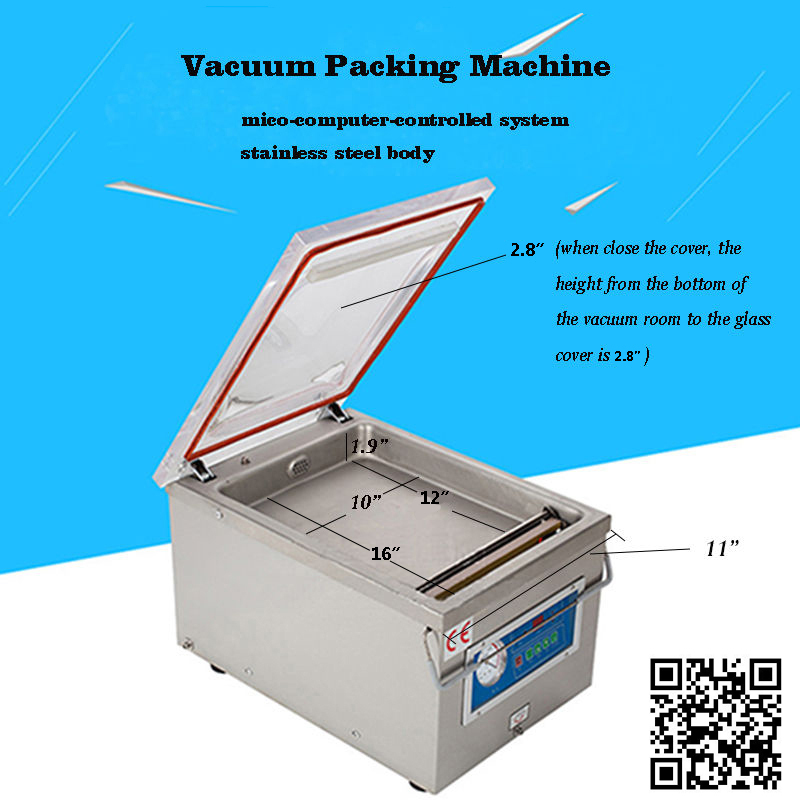 4) The user can see the whole packing process easily. When dial the "Vacuum" button one time it will show original. Dial " Increase" or "Decrease" button to adjust the vacuum time. It will return again when dial "Vacuum" button. Under the stand by state, Dial "Seal" button first and then set the needed sealing time according to dial "Increase" or "Decrease" button. Press the organic cover and the machine will work automatically after set all parameters on machine. Below are the main working steps: A.Inhale air B.Seal C.Tempt. retain 2 seconds D.Exhaust air E.standby mode. 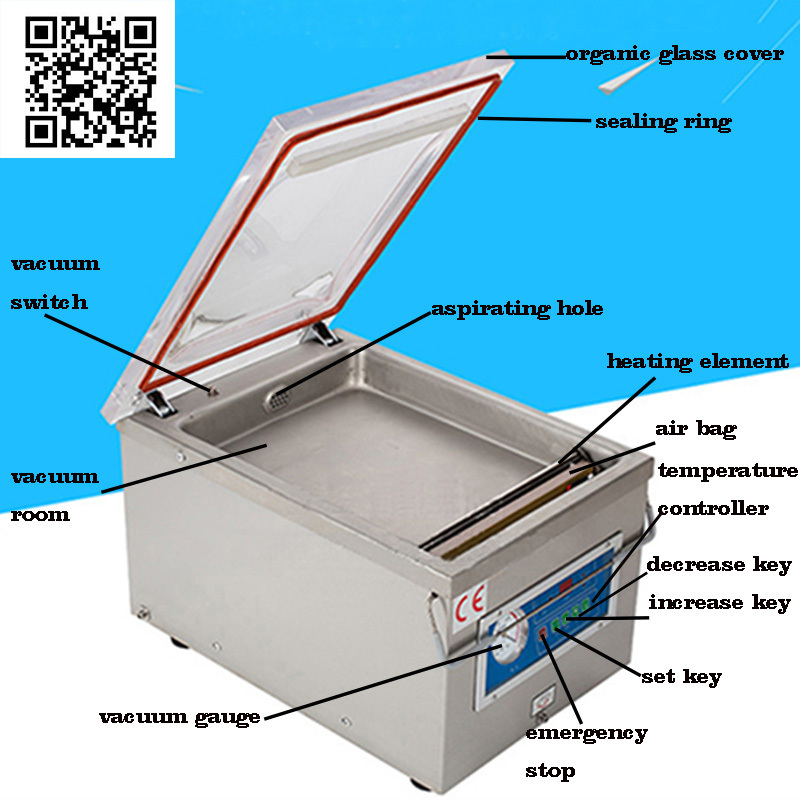 The machine can be fixed air inflation device, like nitrogen gas. The process is between A and B. When need to stop the working in advance or exceptional case happened, please dial " Emergency" key. The machine will stop to work at once.